File this under one of the most hog-wild weekends this spring. 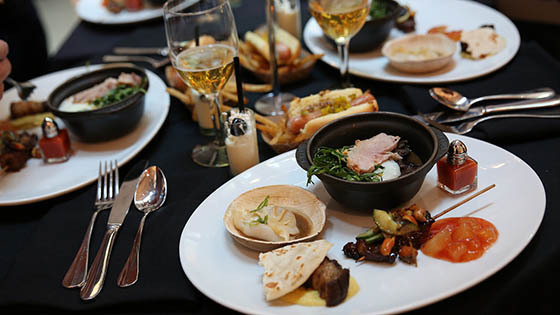 Big props to the folks at Market Social House who will be playing host to a very exciting weekend of food and drink from May 31 to June 2 as three of the nation’s hottest food and drink tours, The Whisky Extravaganza (Friday, May 31), Wine Riot (Saturday, June 1), and Cochon555 (Sunday, June 2) will descend upon Downtown Los Angeles, transforming City Market Social House into a haven for lovers of whisky, wine, and swine. Here are the decadent details. Connoisseur package ($195) – Whisky tastings, Culinary pairings, & a Glencairn tasting glass, and access to the Connoisseur Masterclass with prior registration. Wine Riot is back in Los Angeles with Wine Riot 2.0, hosted by Erik Segelbaum, a 2019 Food & Wine “Sommelier of the Year.” Wine Riot is a tasting event with a twist. Blending the old with the new, they have reinvented educational components and elevated attendee favorites to infuse new life into an event that has continued to introduce new wines to a growing Millennial audience. Wine Riot 2.0 is your opportunity to pick the brain of knowledgeable Sommeliers, taste wines from regions all over the world, compete in head to head challenges with friends, sip on your bubbly favorites, and so much more. Cochon555 is a celebration of heritage breed pigs, fine wines, and world class cocktails set against a backdrop of education and philanthropy. At Cochon555 events, cooks, chefs, restaurant and bar owners, renowned sommeliers and barkeeps, can be found working in concert, with responsibly sourced products, to create luxurious moments, all in the name of supporting family farmers and educating consumers about the agricultural importance of eating heritage breed pigs. Chefs compete for the title of Prince or Princess of Pork and bartenders go head-to-head to be crowned Punch King or Queen. The silent auction and pop-up butcher at Cochon555 benefits Piggy Bank, a start-up farm in Missouri that serves as a kick-starter for new family farms and a safety net for those in the wake of a disaster.